In 2012 Whitestone Boers imported 15 full blood does and a buck from Mugambi Stud for our breeding programme. They were the first new live imports to come into New Zealand for several years. What is impressing me with the progeny from Mugambi goats is they have adapted to our conditions and breeding them in has led to the huge improvement in conformation, particularly bone, muscleing and feet. 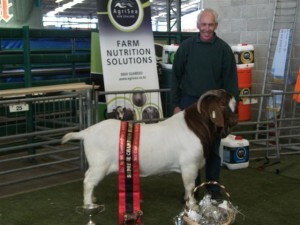 Paul and Jan are among the most successful breeders of Boer Goats in Australia. Breeding the Mugambi Boer genetics along with Whitestone Boer genetics we will produce some of the best here in New Zealand. Mugambi Boers have already proved this at our New Zealand Premier Boer Goat Show at the Canterbury A&P Show gaining Supreme Boer Goat in 2012-2105, and 2017 (see our Awards page for more). To breed superior genetics and produce a Boer Goat capable of surviving in our environment. To promote the Boer Goat through attendance at Shows and participation in NZ Boer Goat Breeders Assn. To offer professional service to clients.